I noticed a small hole in my sweater the other day. I would have passed it off as a snag, if it weren't for the fact that there was another hole right beside it. My heart sank as I looked through my sweater drawer and discovered that moths have turned it into a buffet. The most helpful thing you can do to prevent moths is to wash your clothes before storing them. My problem is that Bay Area weather is unpredictable. You can have 50 degree weather in July and 90 degree weather in October. As a result, I tend to wear most clothes year-round. When the cold weather finally stopped, I forgot to wash my sweaters before storing them, which led to mine and literally my sweaters’ undoing. 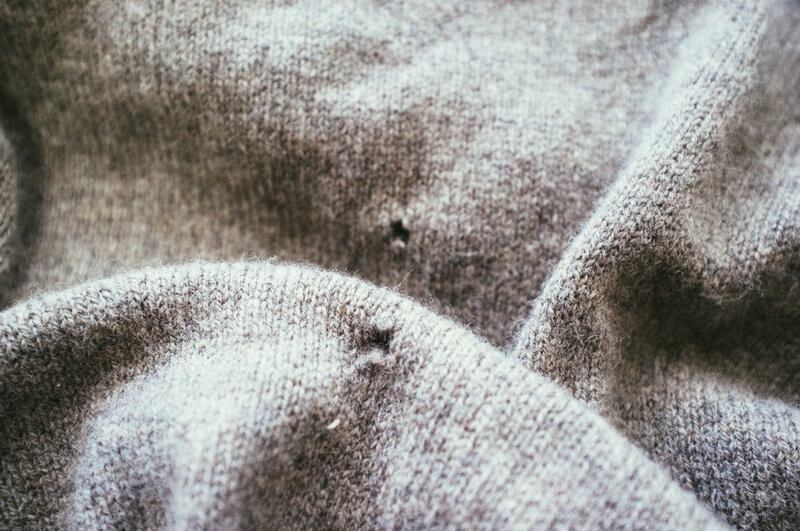 Most of my sweaters only had a few tiny holes in them. I decided the best and most cost-effective solution would be to fix them myself, so I pulled out my sewing kit and watched a video on how to darn sweaters I found on Put This On. 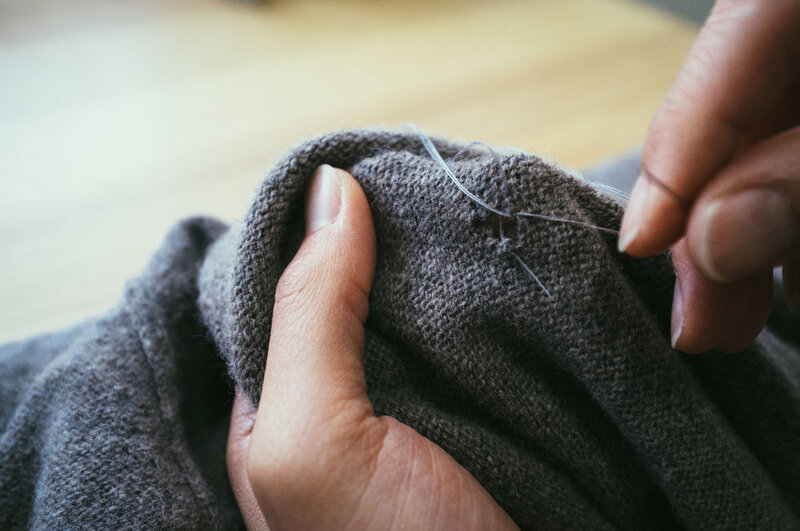 The basic idea is to make a criss-cross pattern by weaving in and out of the sweater’s fibers and the new thread you are sewing. I’m not a skilled seamstress so my first few attempts were rough. But as I continued to work, I found myself slowly improving. One helpful tip is to make sure the thread you’re using matches the color of your fabric as close as possible. This will help make your darning less noticeable. I didn’t have a good thread for this brown sweater, so you can see how the grey thread stands out. However, I did have burgundy colored thread, which made that repair more discreet. The last sweater I had to darn was my cardinal sweater from Gant by Michael Bastian. The sweater suffered over 14 moth holes and really looked like it was on its last legs. I reached out to Stu at RaveFabricare to see if they could professionally reweave it. He was honest and told me that the cost to reweave this sweater would be significantly more than what I paid for it originally. I decided to try and darn all the holes myself. In the end, I would either have to throw it away or the sweater would be fixed - so I really had nothing to lose. I started to work on the smaller, easier holes first. Then I worked my way up to the bigger ones. In the end, my job looked like this. It’s not perfect. One can easily tell that the sweater has been repaired, especially since I had to use black thread because I didn’t have the right shade of navy. But still, I think the sweater looks good. The repairs are charming (in a wabi-sabi way) and I have to admit, there is a sense of pride in fixing something yourself. While it was unfortunate that the moth attack happened, in a way, I’m actually thankful that I had the ability to learn and use a new skill. Now if you excuse me, I have to apply pouches of cedar and lavendar to everything in my house.